Financial struggles are a big part of every person’s life. There will always be struggles people go through on a daily basis. These struggles can vary in degree and the time it takes people to recover. However, there are ways to help you use these situations to improve your finances. As you look at financial problems, there are a lot of contributing factors to it. 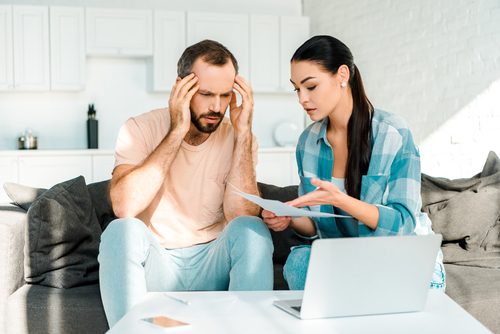 Here are some of the most common reasons that plague the finances of most consumers. When you talk about financial challenges, there are a host of different scenarios but one of the earliest types of struggles people face is the inability to land a job. Coming out of college without any job prospects can be alarming since it usually takes some time to land a job. There are some who are able to get one quickly but the averages paint a different picture for most job seekers. Talent Works shares that people have an 8.3% possibility of getting that job just from one application. What this means is that for people to get one interview, they need to send out anywhere between 10 to 20 job applications. And to get that job one offer, applicants would need to have anywhere between 10 to 15 job interviews. The challenging part in these is that even fresh college graduates already have bills to pay. There is also a big possibility that they have loans to pay under their name. The biggest of which can be student loans. There are some types of student loans that gives graduates a grace period before they have to send their first payment. This is one of the reasons why unemployed can be a challenging situation for fresh graduates. Landing a job is a great development but keeping it is a different matter altogether. One of the biggest financial struggles for people is when they lose their current job. There are a number of reasons why you might lose your job. But the bottomline is that losing your primary source of income can be nerve-racking. You start to run down on all the financial obligations you have every month. Starting from the basic necessities of your family like food, clothes, and even medicine. You then move on to big payments such as the one for the house and even the car. Without a steady source of income, it will be difficult to meet all these obligations. Financial struggles are usually the result of having to go through something you did not plan for. Apart from your job situation, there will be other instances where you might suddenly find your finances in peril. There can be situations where you have to face medical emergencies. It might be for you, a family member, or even a friend. Sometimes, you might have to face unexpected repairs for your vehicle or even at home. There will be instances when you are not the one in need but people around you. Family and friends might have an emergency and helping them would impact your own finances. But you cannot just stand by and not help them. This is a good time to use your emergency fund if you have any. The examples above are just some of the instances why you would have financial struggles. However, depending on how you manage it, it can lead to financial breakthroughs. Here are some of the things you need to consider when you are faced with challenges in your finances. There are times when having your back against the wall pushes you to be creative and find ways to address your problems. Some might say that this is a human instinct where you are looking for ways to survive. We are built to be creative and there are times when you just need a little jolt to tap into that creativity. You might be having some difficulty making ends meet with your current household budget, you need to be creative with some of your expenses. It is a good idea to start looking for areas in your finances where you can save money. Financial challenges will always be a part of your life but it does not mean that you have to stay there forever. You can save on your food budget when you start to buy in bulk and even prepare as well as cook your own food at home. You might be surprised to know that Americans spend about $70,000 in their lifetime for take-out food according to NY Post. Buying and cooking your own food can help you save a lot of money at home. Your creativity comes out with your talent in cooking and finding ways to make your ingredients work for a healthy meal for your family. If your transportation budget is getting out of hand, you can start riding the bike to and from work. You can also look for carpool opportunities so you do not only save money but meet new friends as well. Losing your job can be a big cause of concern because your inability to meet your payments can be the start of your financial struggles. However, there are instances where you lost your job because your heart is no longer in that field or even industry. It is also possible that you lost your job because it is already a nightmare working with some people in your office. If you have heard someone say that for every door that closes a new one opens. This can be true especially when you lose your job. It might be time to look for a new company which values their people more. It might be high time that you look for a change in career or just expand your talents and skills to land better jobs. No one wants to go through financial struggles in life but we all do. One thing you can do is to take the lessons these situations give you and use it to be a better version of yourself in the future. Much like when you exercise – you break your body down to make it better, faster, or even stronger. The same can be said with your financial challenges. Doing so allows you to be smarter in the future. You can make preparations so the same thing does not happen again. You can also use these challenges to help you handle the same thing better in the future. The better you become, the more efficient you become in managing your finances. You get to adapt quickly to help you manage problems better. There are a number of financial struggles people go through on a daily basis and the best thing to do is to learn from them. You can never stop these struggles for coming into your life. The best thing to do is to look at them at positive light and always look for the silver lining in these turbulent times.